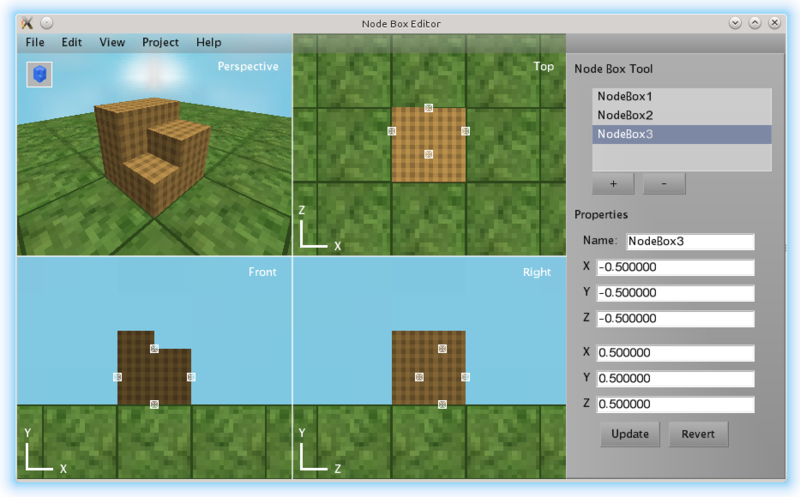 Use this editor to easily build node boxes by dragging their edges. This program supports all operating systems Minetest supports. It is recommended that you compile it yourself. Please see the documentation on make install if you want to install it system wide. What actions you can take are limited by which mode / tool you are in. Use WASD to move the perspective view. Hold the middle mouse button over a viewport and drag to move it. ...or use the options under view to pick which viewport to show. Use the mode icon on the top left of the screen to change modes / tools. Click the icon to pop out a list of modes / tools. Click an icon to select the corresponding mode. Press N to enter the node tool. Press B to enter the node box tool. Press T to enter the texture tool. Open Project - discard the current project and open a new one. Save Project - save the current project. Save Project As - save the current project to a new file. Exit - exit the editor. Limiting - toggle whether node boxes can go outside of node boundaries. Snapping - toggle whether node boxes will snap to a 16 pixel grid. View - use these options to change the viewport (tiled, or make a viewport fullscreen). Project - options unique to an tool. About - see program's version, and credits. In this mode / tool, you can edit the contents of a node. Icon: A blue cube with a chunk taken out of it. Size the node box using the handles in the orthographic viewports. Scale the node box by pressing control, and using the handles in the orthographic viewports. Position the node box by pressing shift, and using the handles in the orthographic viewports. Enter properties for a node box in the text boxes on the side bar. Click revert to discard your changes, and get the current properties. In this mode / tool, you can create multiple nodes and manage them. Icon: A yellow cube. In this mode / tool, you can edit the textures of a node. Icon: Red, green and blue cube. Click a face in the side bar to open up the texture dialog. Click import to import an texture. Type the location relative to the NBE root if a portable build, or relative to the home directory if installed. Click export to export the currently selected texture to the nbe root folder if portable, or the home directory if installed. Click an texture in the list box to select it. Click apply to apply the selected texture to the side of the node. The editor can currently save and export to several formats. Node Box Editor file (nbe) - The file unique to this editor. General save / open format. Lua file (lua) - Exports code which could be installed as a mod. Use when you want to run in Minetest. Minetest Classic (cpp) - Exports code to be used in Minetest Classic. Use when you want to run in Minetest Classic. # Do not include bin/minetest or bin/minetest.exe in the root.